When attending a sporting event of any kind, I can’t help but really get into the spirit of the event. 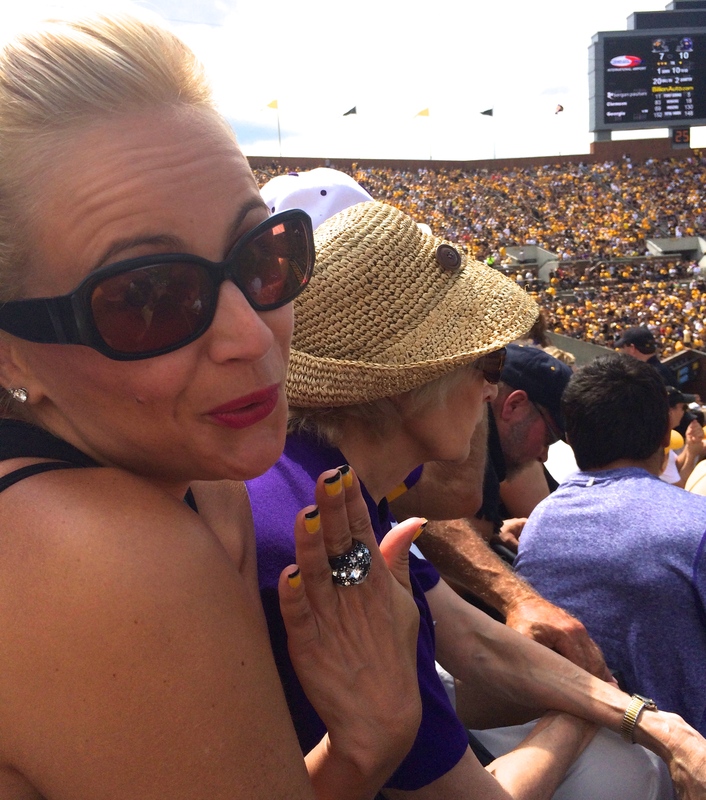 This past Saturday, I was gussied up in my finest Hawkeye threads…. Yep. Ready for the game. 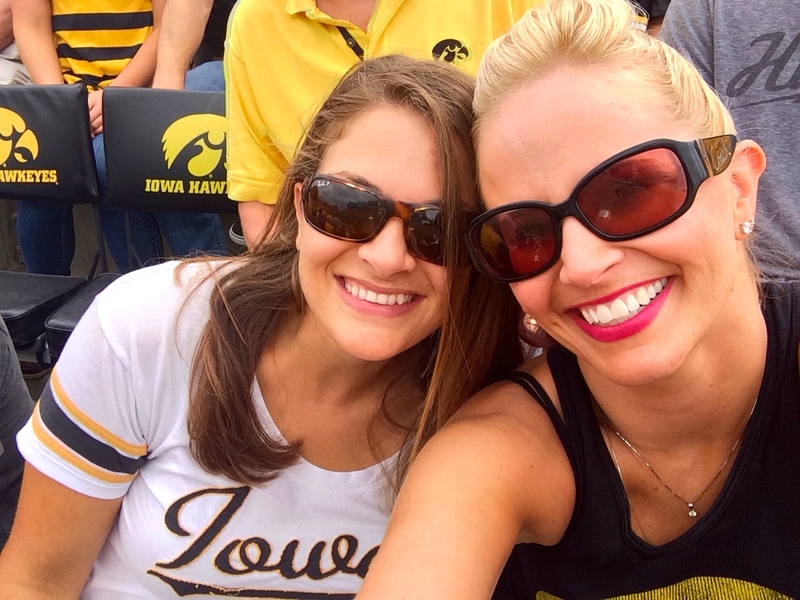 I had a hot date with my college roommie…. 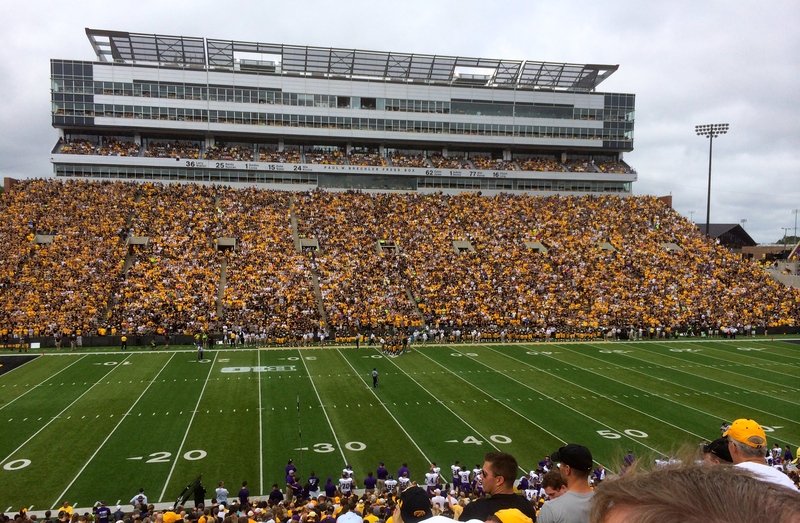 And when we entered Kinnick stadium, we might have thought the crowd was cheering our arrival. Rush of the roaring crowd. Our high was quickly sucked away by the Debbie Downer (and fan of the opposing team) sitting to my left in the straw hat. Yes, the one who was approximately 102 years old. Fun hater to my left. You see, Whitney Lover and I were simply happy to be together. In our old college stadium. With 70,000 of our closest friends. And we are not the most soft-spoken ladies. Nor are we the classiest ladies. Nor are we any kind of boring. So we cheered. We hooped. We hollered. We would have done toe touches if we were still limber enough if there had been enough room. We were so happy we felt the need to document every other second. Hi. We’re here together and I have 4.2 million photos to prove it. 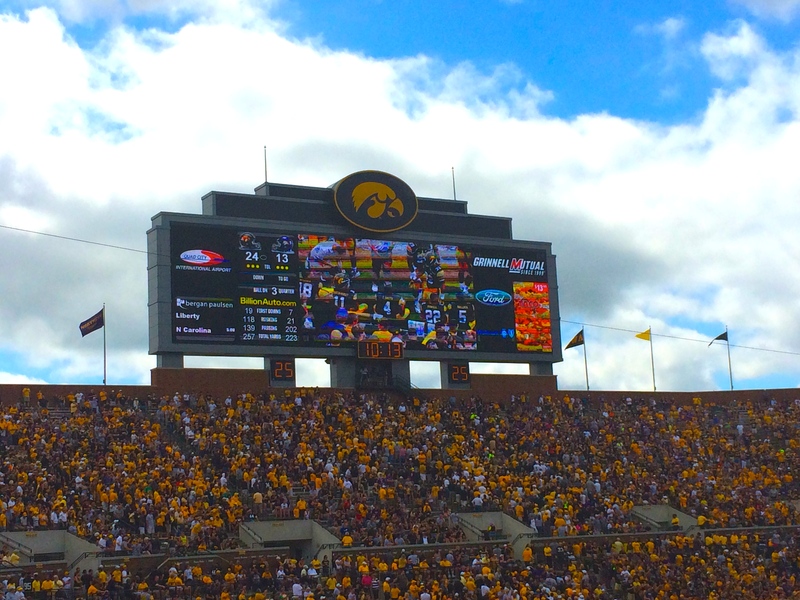 Have you seen the working scoreboard? Did you know we witnessed the marching band? While over enjoying the atmosphere, I overheard the 102 year old tell her hubs that she was “appalled” (yes, she said appalled and yes, I was keeping my hands to myself AND I hadn’t even been using my favorite f word, as the Hawks were winning) by our loud, obnoxious behavior (and most likely the pink streaks in my hair). 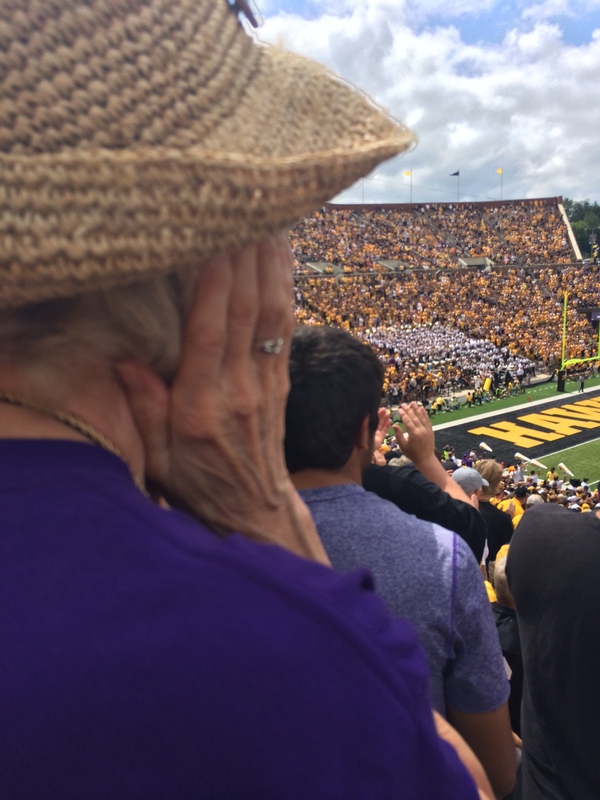 So when she squeezed her ears shut as the fans around her cheered for an Iowa touchdown…I may or may not have been inches closer to her ear than necessary. Just to make her day a little more fun. 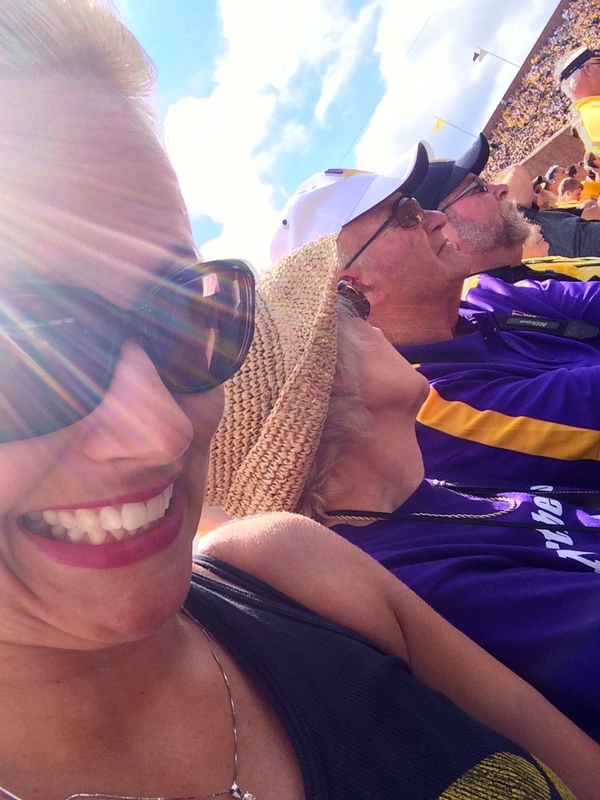 This entry was posted in FUN!, How to... and tagged Blog, caption, classy, Football, football game, Friends, gaming, Humor, inappropriate, Iowa, Iowa Hawkeyes, Kinnick Stadium, Life, personal, Tailgate, unruly fan, White Trash. Football has the most obnoxious fans. I know as I’m a season ticket holder. I’ll be drinking this Sunday! Like there’d be any other way with me….! Boy, they really jam them in there like sardines, huh? Oh boy…sardines may be an understatement. You can’t help bu almost elbow someone in the face when trying to stand up and cheer! Good conditions for photos. 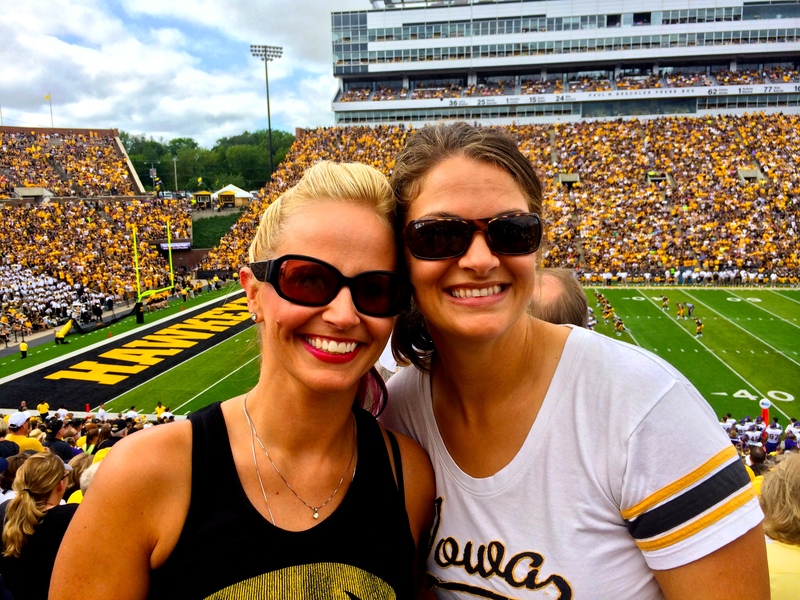 I want an Iowa Hawkeyes shirt! I like the yellow hawk. 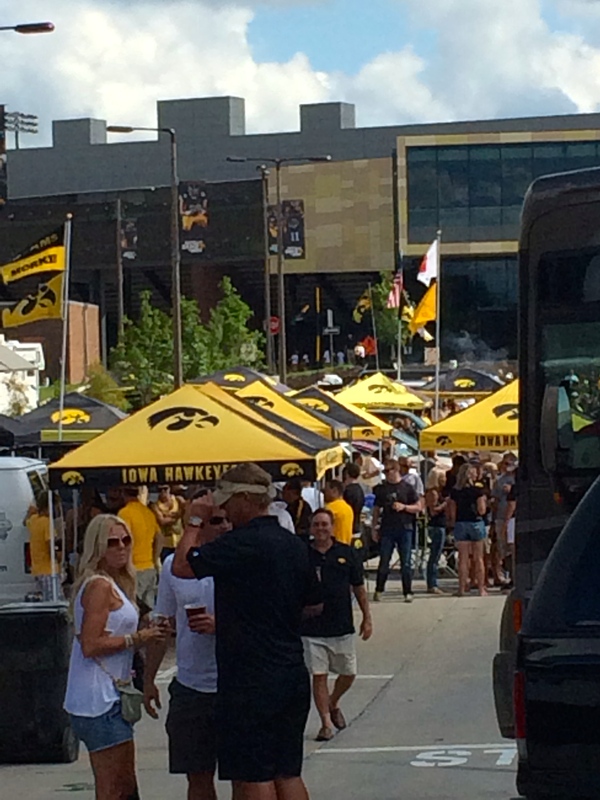 I can arrange a Hawkeye shirt for you! All I need is your size. You are AWESOME. I too am one to leave it all out on the field/ice when attending a sporting event. I have been known to arrive at a SJ Sharks game and lose my voice before the puck drops. LMAO. As for the blue haired alumni from the other school? I find it APALLING (yes I said it) that she would dare to challenge the Alma Mater Mastery that is CBXB. Hope you left her with a ringing in her ears. Other than the buzz from her hearing aid I mean!!! Keep rockin the colors and waving the banners Jazz Hands. You sound like my kinda fan – hoarse before the puck drops. Money! Oh did my blue haired old lady friend leave with ringing in her ears….Such a silly girl to challenge my Alma Mater Mastery!!! I bet she watches her team on TV for the rest of the season. Just sayin’. If you could experience the way the Sharks take the ice you would totally understand. Skating through the mouth of a giant Sharks head with fog machines and Metallica’s “Seek and Destroy” cranked at 11. The whole place comes unglued. Pretty easy to lose your F-ing mind without even trying. 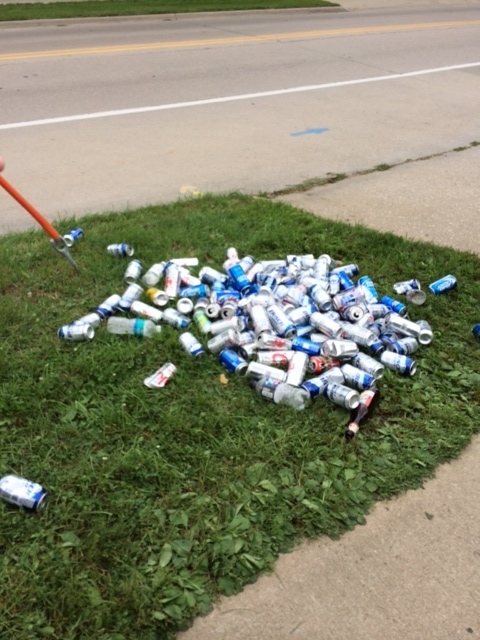 Pretty discouraging to see anyone not having fun at a game. ESPECIALLY college football. Besides Hockey (IMO) that has to be the second best sporting venue to go to live. So much energy. But some people reach a certain age and forget how to have fun. Hope that never happens to me. LOL. Like that could even happen. HAHAHAHAHA. You’ll never forget how to have fun. That would be like me forgetting how to have fun. THE HORROR! Your Sharks games sound insane! There’s something about the energy in an arena when the music is turned up to 11…. And neither one of us will forget. And from what I have seen so far, your family will never LET you forget how to have fun. Stay cool Jazz Hands. Sounds like I need to visit the Shark’s stadium!! It was too much fun sitting next to old lady cranky pants, egging her on! I just get the unruly for the most part! With hot looking fans like you two, we’re sure the crowd was cheering at your arrival, ladies. All teams need fabulously glittery, selfie taking, cheering, unruly troublemaking fans like you. I say on top of trekking to Vegas one day, we need to hit up a sporting event and spread our glittery fabulousness. With cocktails, of course. You are a good fan. Why did UnFan go to the game, I wonder? Really? At the Syracuse games I am THE LOUD GUY and, yes, I annoy some people around me. (If I go too far by being TOO negative or disparaging about the opponents or a bonehead play by the hometeam my dear wife Karen then clamps down on my thigh I and rein it in.) Mostly though I stay clever and make them laugh. I love it! 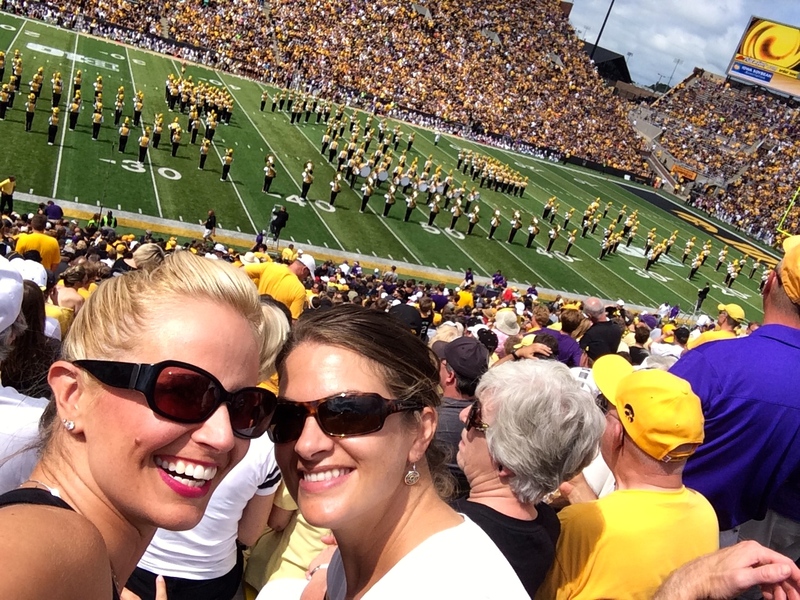 What fun would sporting events be without spectators like you and me? I thought the same about old lady coming to the game if she was going to be a fuddy duddy. I mean, the spirit of rivalry is the best part, right? She brought a whole new meaning to the phrase “that section was dead.” Almost literally, no pulse, CBXB, from the looks of her pale face and pursed lips staring you down. Amazing how packed the stadium was – soooooo fun!!!!!! Soooo fun and soooooo loud. Just ask my seat buddy. Oh wait, she can’t hear you because her fingers are in her ears. What is it with you and old people, Gma excluded of course. First the old guy at the restaurant and now the unfan. I’m seeing a pattern here. Yes, it’s the hearing aids. I think you’ve solved this mystery! 🙂 Maybe she should have turned it off. Just sayin’. I think I will advise anyone near me with a hearing device to turn it off before I get ‘offensive’. This way, I can have all kinds of elderly best friends. Yay me! It would be the kind thing to do. Might it help your singing career too? HA! I’m sure it would help my singing career! 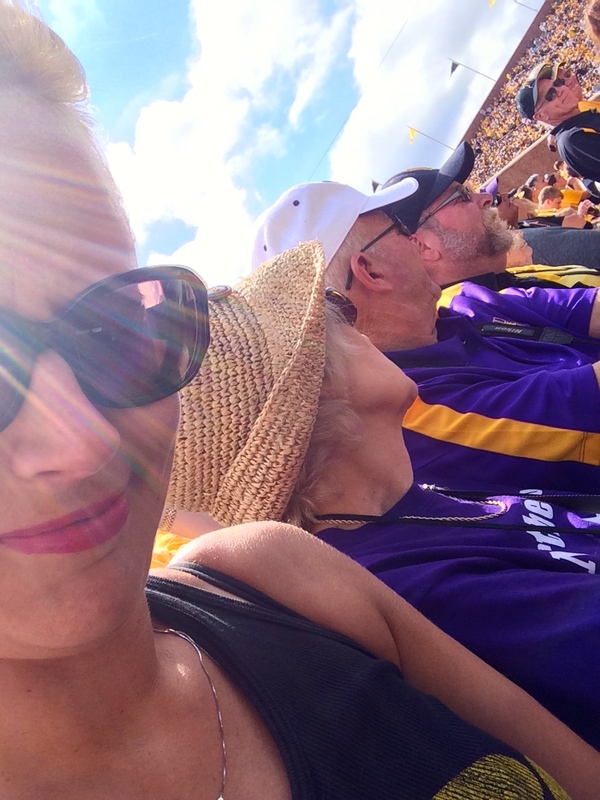 Hahaha…….. you’re so fun 🙂 with that lady and all those people /sport fans together, you must have felt so amazing to may can sit there, fantastic !! That lady had zero fun sitting beside me. Oh well – her loss! It is always a fun time going to a football game with all of the other fans. A big time rush!